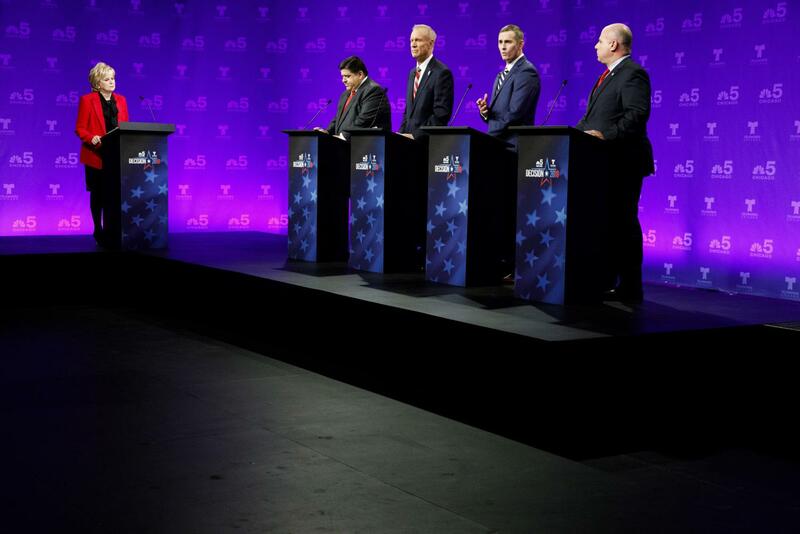 All four candidates vying to be the next governor of Illinois hit the stage Thursday night to field questions from DePaul journalism professor and Chicago broadcaster Carol Marin in what quickly became a vicious debate between front-running Democrat JB Pritzker and Republican Gov. Bruce Rauner. In an August NBC/Marist poll, Pritzker led with 46 percent support, Rauner with 30 percent, Libertarian Grayson “Kash” Jackson with 6 percent and downstate senator Sam McCann with 4 percent. Jackson and state McCann joined their high profile counterparts on the stage looking make a bigger name for themselves with one obvious, albeit historically likable, pitch between them: we aren’t billionaires. Jackson, who continued to recite his total campaign expenditure of a modest $25,000, accused Pritzker and Rauner of pretending as though he and McCann do not exist and buying their way onto the stage. “We have to begin to elect people that come from our neighborhoods and understand what it is to struggle day in and day out,” Jackson said. Pritzker and Rauner certainly acknowledged the presence of Jackson and McCann but they did little more than that. At one point, Rauner called McCann a “phony” candidate, pointing to funding by an organization that endorsed Pritzker and donated half a million dollars to House Speaker Mike Madigan. The majority of the time the billionaire and multi-millionaire spent talking was directed at each other, rehashing lines from their campaign ads in front of a live, primetime audience at NBC Tower. With no public service record to attack, Rauner focused on three things to take Pritzker off his feet: toilets, bank accounts and corruption. After Marin kicked off the action with a question for Pritzker about skirking over $200,000 in taxes after he removed toilets from his Gold Coast mansion before a tax assessment, Rauner continued to dragged that thread through the entire debate. Rauner repeatedly mentioned the fact the Pritzker was born into a billion- dollar family and using his personal, inherited fortune to buy the highest political office in the state. A venture capitalist himself who has also spent millions of his own money running for governor, Rauner paused to numerous times to note that there is nothing inherently wrong with inheriting massive wealth, so long as you don’t leverage it for political gain. All of this, he says, shows that Pritzker will simply be a continuation of the same corrupt practices of Madigan and the democratic machine. On the topic of the candidates’ massive warchests, Marin asked both candidates, starting with Pritzker, if they were at all embarrassed by the fortunes spent on their campaigns. “No,” Pritzker said. “I think this race is about values, not about money.” Rauner laughed. “[Is $126 million] a reasonable amount of money to put into a campaign?” Marin asked. Pritzker, having the benefit of being able to pick apart a sitting governor’s record, took Rauner to task for being a “failed governor” and a “liar”. The Democrat continued to bring up the state’s credit score — the worst in the nation — and “unfair” tax code numerous times, and pinned the blame squarely on Rauner. Rauner deflected blame, pointing to Madigan and his allies for preventing his administration from making progress on some of the state’s many issues. To close the forum, Jackson and McCann made calls for political unity and electing trustworthy representatives, while Pritzker and Rauner took their closing comments to rehash their beefs about toilets, corruption and taxes.